Among the various activities of our laboratory we organize on request mosaic courses for groups of children and school groups. They take place both in the laboratory or in the school or in spaces belonging to the people organizing it. 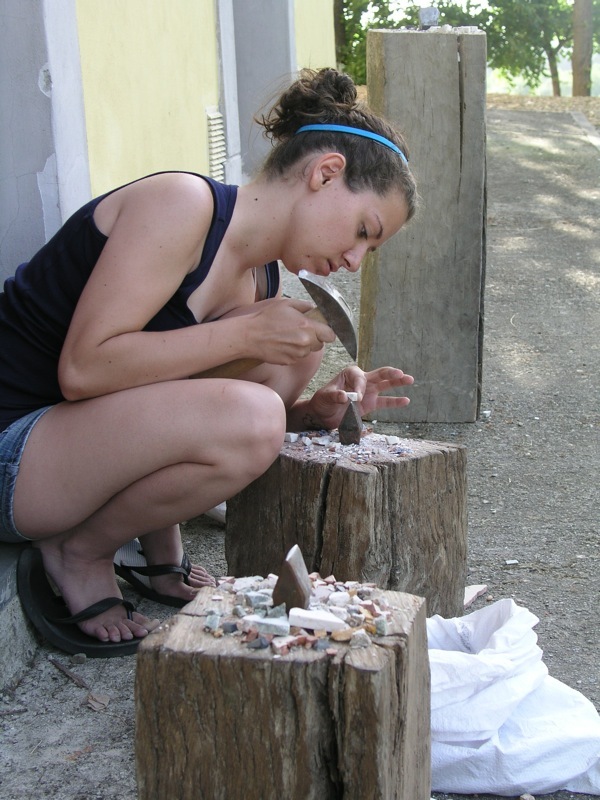 The courses are also part of the activities for the summer holidays in an atmosphere of play and experimentation. 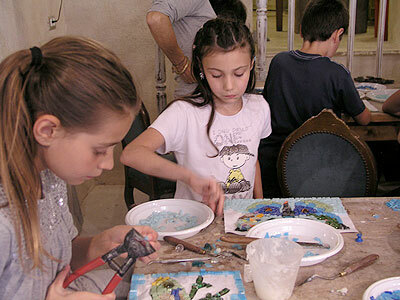 We propose a simple and playful approach to the technique of the mosaic; Normally we use the technique of the direct method: the most practical way to make mosaic with children. This technique is the oldest and is to lay the tiles directly on the final binder. The course will begin with a short planning phase where every child will have to prepare a simple design that will be the basis on which he will operate with the mosaic. After the design phase the child will begin to learn about the materials to select for color and shape and put them in place. He will bring home his mosaic along with a certificate of participation. 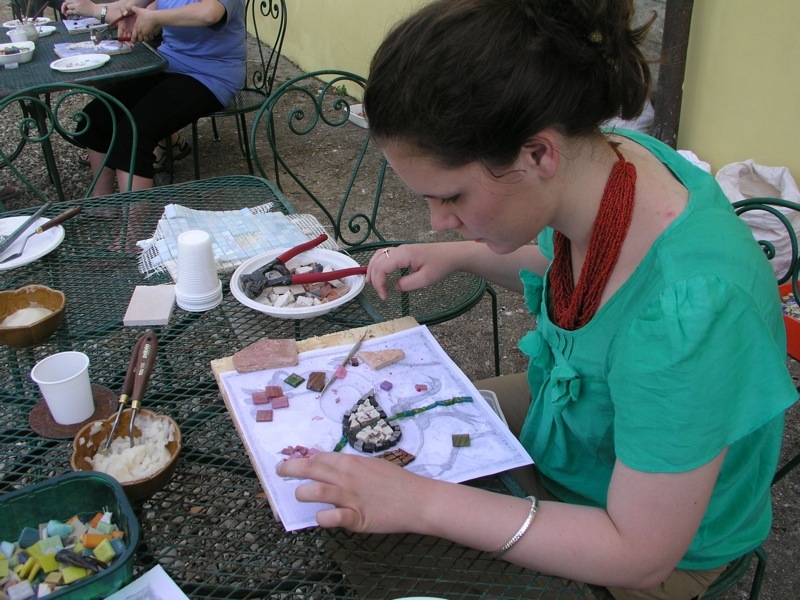 A simple and playful approach to the mosaic technique, during the course we will use the direct method to make the mosaic with the children, that is, to lay the tiles directly on the binder. 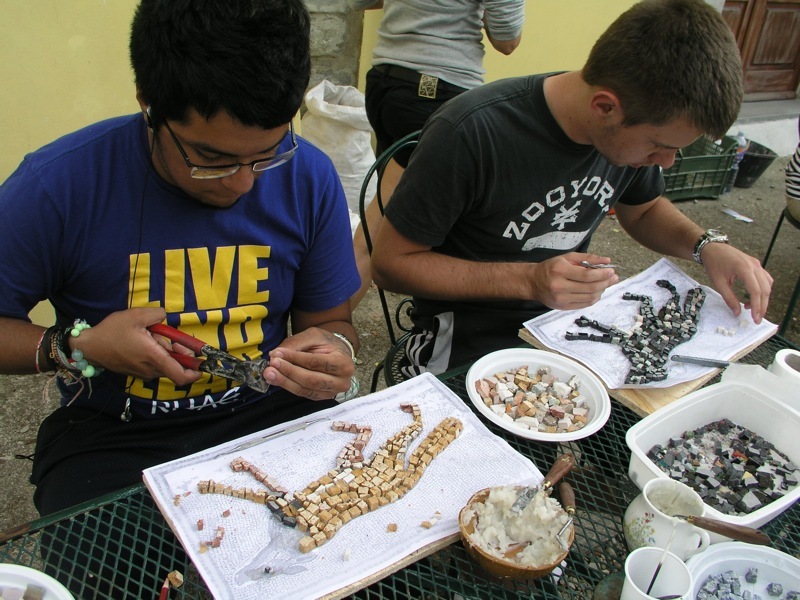 The course will begin with a short planning phase, each child will have to prepare a simple design inspired by the numerous images of fossils found in the area mondainese or the ancient symbols painted on pottery. From this basis we will start to work on the pannel, the course will continue with practical approach and essential rules of the mosaic, materials and tools to finally get to the installation of the tiles that will compose it. The laboratory provides for the revival of the technique to create the mosaics as in Roman Republican time were they coated waterproof and graced the floors of baths, forums, temples, private houses. We will use black and white stone tiles to create patterns of geometric and floral drawings. The laboratory provides for the construction of the most significant of Byzantine iconography in the magnificence of its colors. The mosaics will be played through glass tiles laid in the work of bonding with the technique of the direct method.